Alina Starkov is a teenage orphan with a talent for cartography. She volunteers her talents, along with her best friend Mal, to the army. When her fleet is attacked by monstrous creatures, she finds an unexpected power that allows her to save her friends. She is taken to the powerful Darkling, who determines that she is a Sun Summoner. Alina is trained to destroy a dark power known as “The Fold.” The Darkling seeks the antlers of a rare stag because he claims that they will amplify Alina’s powers. Alina discovers that the Darkling’s intentions are not what he conveys, and she attempts to obtain the antlers before he does. As the Darkling’s power grows, Alina must find a greater power within herself in order to defeat him. The only problem is, she does not fully understand her abilities, and her progress with training is slow. She must truly dig deep to overcome the Darkling and save her people from the vicious evil of The Fold. I enjoyed this book for the most part, but it did not inspire much reflection within me. The division between good and evil is pretty clear, and there does not seem to be a lot of grey area. As is expected, light ultimately triumphs over darkness. 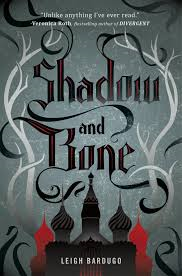 After some thought about the title, I determined that “shadow” signifies the shadowy nature of The Fold, and “bone” signifies the stag’s antler used to amplify Alina’s powers. This is a quite literal interpretation, but that seems to be the style of the writer. Although there is a sequel to this book titled Siege and Storm, I most likely will not read it. Reader’s Annotation: Can Alina’s power over light overcome the evil darkness that is plaguing her world? She is about to find out. Describe Alina’s first encounter with her magical abilities. Describe Alina’s frustration as she attempts to harness her power. Justification of Selection: This book has a traditional “good” vs. “evil” storyline that is bound to appeal to teens, especially younger ones.